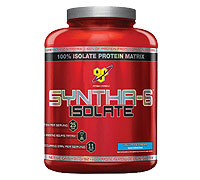 SYNTHA-6™ ISOLATE is BSN®'s latest ultra-premium protein powder, made with 100% isolate protein sources. A 50/50 blend of whey protein isolate and milk protein isolate (a high-quality source of slow-digesting casein), the formula's unique ISOLAST™ protein matrix delivers a mix of fast- and slow-release proteins that promotes a moderately-paced release of amino acids to fuel active muscles. Drinking SYNTHA-6™ ISOLATE provides the fast-releasing benefits of whey isolate and the prolonged amino acid release of casein for the ultimate post-workout recovery shake. And because it's BSN®, the rich and satisfying taste is unmatched by any other protein supplement, despite having less than half the fat and carbs of original SYNTHA-6™.